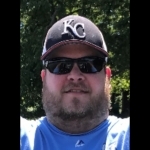 Derek Kenneth Dietz, 38, Lenexa, KS, passed away Wednesday, August 15, 2018, at Overland Park Regional Medical Center. A Celebration of Life Service will be held at 10:30 a.m. Saturday, August 25, at Holy Trinity Catholic Church, 13615 W. 92nd St. Lenexa, KS 66215. In lieu of flowers memorial contributions may be made to the Holy Trinity School Guardian Angel Fund. Derek was preceded in death by his father, Kenneth Dietz. He is survived by his wife of 10 years, Katie, children, Jaxson and Peyton, mother, Cindy Dietz, sister, Anna (Tony) Cattau, niece, Hallie and nephew, Wade. Our sympathy and prayers go to the entire Dietz family on the loss of Derek.